Your eyecare is our top priority. 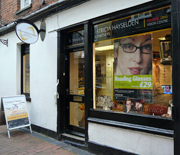 As Wallingford’s premier independent optometrists (opticians), we are committed to providing you with the very best vision care at an affordable price. You will receive a warm welcome from our knowledgeable eyecare team, who will take the time and care to look after you. We provide high quality optical care for the whole family (NHS and private); spectacles and contact lenses. We offer a very friendly, personal and relaxed service from highly trained professional staff. Retinal photography is available to all patients and as part of Oxfordshire’s diabetic eye screening service. Our latest digital camera can also assess your risk of developing age related macular degeneration. Home visits are available within a 15 mile radius of Wallingford. A monthly clinic is held at Goring doctor’s surgery, for our less mobile patients in Goring. Assessments of suitability for refractive surgery (laser or surgical correction of vision) with referrals to local ophthalmologists or our partner clinicians, Advanced Vision Care in Harley Street, London. In conjunction with Hidden Hearing, hearing testing and hearing devices are now available at our practice in the heart of Wallingford.